If you are like our family, coming together for the holidays means bringing the whole family—including the dogs. Earlier this week, we covered how to introduce dogs on neutral territory. Now it’s time to look at ground rules for the next step: coming into the resident dog’s home. Plan your entrance before it happens. The craziness at the front door that most doggy households experience when guests visit should not include bringing in another canine at the same time. For the best experience, call ahead to let your host know when you’ll be arriving. When you arrive, keep your dog in the car while you unload the family and bring stuff in. Go ahead and enter the home, greet your people and greet their dog. Let the excitement die back a bit before you get your dog out of the car. After people have settled and the resident dog has been leashed or confined so he doesn’t meet your dog at the door, bring your dog in on leash. She has to meet all the people and adjust. Don’t make her meet the new canine friend at the door too, especially if the either dog is known to have any “issues” with making friends. Next, I like to take both dogs outside so they can get acquainted, exchange pee mail and deal with each other with more space. Let your dog into the yard first on leash, then the resident dog. Her nose will tell her you’re there, but it’s a good idea to begin speaking as she comes out so she has a chance to see you and your dog before the surprise hits. 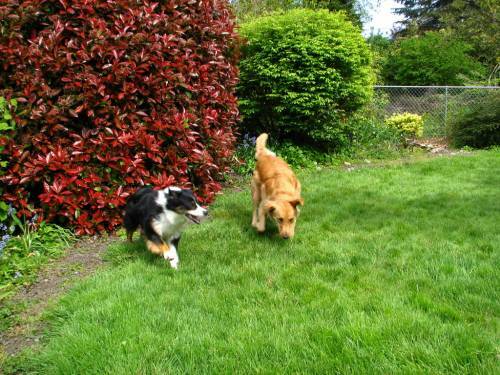 As soon as possible, let both dogs off leash as the lack of tension will generally allow for more relaxed interactions. If needed, one or both dogs can drag a leash if you feel like a quick handle would be helpful. At least, usually they don’t. Some dogs have a high tolerance for other dogs or people using their stuff, sleeping on their beds, etc. But other dogs? Not so much. Sharing is not typical, especially among dogs that don’t live together. Be sure that the resident dogs’ favorite items are put away. 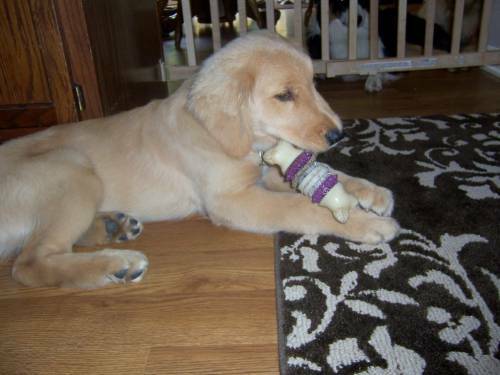 No need to squabble over the best toys and bones. If there need to be toys out (for example, because somebody is a puppy who needs to chew), have multiples of each item—at least one per dog, plus one or two extras. When I have multiple dogs in a room and they all like plush toys, the floor is covered with plushies, making it extremely hard for any dog to hoard or guard. The worst mistake I see dog owners make is to scold their dog for expressing his emotions by growling. The same is true when resident dogs are asked to not only tolerate intruders (both people and dogs), but act sociable when the invader happens to be a disrespectful jerk. Kind of like having that loud, obnoxious drunk uncle show up for every family gathering and being told, as a kid, to let him kiss you. Uh, no thanks! If you know your dog has a low tolerance for intruders or you see her being uncomfortable, simply give her a space to call her own. Put the intruding dog elsewhere. Or if that can’t happen, put her in her favorite sleeping space with a high-value chew or packed kong. Whatever you do, don’t break your dog’s trust by correcting her for requesting more space via growling. Honor the resident dog (or other pet). If you and your dog are the visitors and the resident dog/cat/bunny/bird is uneasy for any reason, her opinion comes first. Don’t let your dog be that rude uncle! Take your dog outside for a walk or put him in a crate with a high-value chew. You might also consider options such as leaving him home or boarding him. It’s not at all fair to the resident pet to give up all the space when it’s her house. Territory is important to dogs and cats especially. And if dogs don’t like sharing, cats despise it! So, keep your dog off the resident pet’s favorite bed, put down a different bowl of water, bring your own chew toys rather than letting your dog raid the resident’s toy box. Be a good guest! These are some basic ground rules for encouraging polite behavior during a holiday visit. In our next article, I’ll share some ideas for getting dogs to settle in for a longer visit so you can enjoy some overnights at Grandma’s and create great memories at the same time. If you feel like some hands-on coaching around food, greetings and distractions would be good for you and your dog’s manners, check out our Holiday Manners Tune Up – it’s only two weeks long and will get you pointed in the right direction. Or, simply reach out by email or phone. We’d love to help.